Horse's teeth continually erupt throughout their lives. Every horse wears its teeth differently while grinding their feed. Horses develop sharp enamel points as their teeth wear. These points can cause pain and even ulceration of the cheeks and tongue. 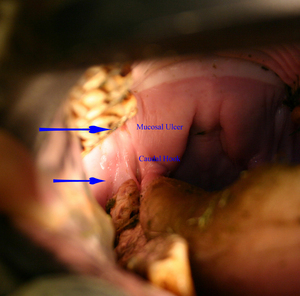 The most common procedure veterinarians perform on horse's teeth is called Floating. It is simply the process of filing the points of the teeth down. We have been able to improve our ability to float teeth with the advancement of motorized dental equipment and more specialized instruments. Regular dental examinations and maintenance are important to maintaining or improving feed efficiency, performance and comfort of the horse. The vets at Conley and Koontz Equine Hospital recommend that every horse get an oral examination twice a year. Conley and Koontz Equine Hospital is here to ensure that your horse's teeth are properly cared for. Dental care can be provided at the hospital or at your farm. Our clinic is equipped to handle routine dentistry and more complicated dental cases. 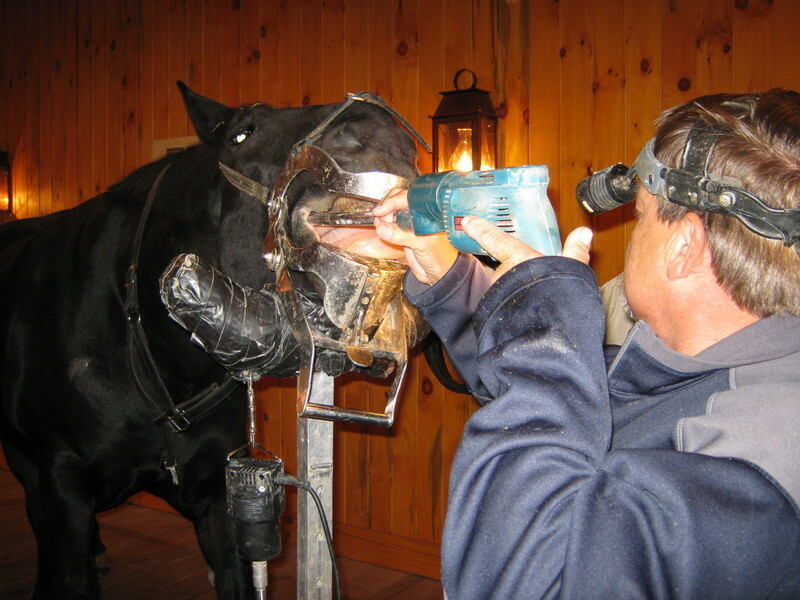 Unlike lay dentists, our training and experience in equine dentistry are what allow us to provide the best in equine dental and veterinary care. If your horse requires radiographic or endoscopic examination, we have the ability to perform these diagnostics. Frequently teeth can be extracted intra-orally without any facial deformities. ● Sharp enamel points forming on cheek teeth, causing lacerations of cheeks and tongue. ● Retained caps (deciduous teeth that are not shed). ● Discomfort caused by bit contact with the wolf teeth. ● Hooks forming on the upper and lower cheek teeth. ● Long and/or sharp canine teeth. ● Lost and/or broken teeth. ● Abnormal or uneven bite planes. ● Infected teeth and/or gums. ● Misalignment/poor appositions (can be due to congenital defects or injury). Floating is especially important in horses who have lost a tooth, or whose teeth are in poor apposition and do not fit together well. Normal contact with the opposing tooth keeps biting surfaces equal. When cheek teeth are out of alignment, hooks can form. If left unbalanced, these hooks can become long enough to penetrate the hard or soft palate. Small hooks can be removed by floating. Longer hooks are usually removed with molar cutters. Dr. Conley has pioneered advanced equine dentistry in the state of Indiana. He has been part of the leadership for several dental organizations, presented at multiple dental meetings, and has been a guest lecturer for veterinary students. Dr. Conley has performed advanced dentistry on over 300 World Champions.